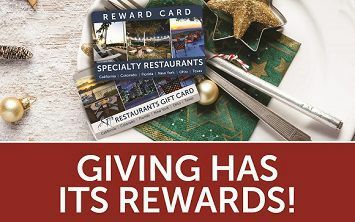 The season of giving is upon us - give the gift of dinner with a view! *Promotional offer valid 11/01/16-01/01/17. Gift cards are valid on next visit. Reward cards valid 01/02/17-03/31/17. One reward card per check, per visit, per table and cannot be combined with any other offer. Reward card not valid on Special Events.